Looks like you've been having a TON of fun!! These are all awesome but your last card is a total jaw dropper! What fun cards. I love that adorable little scene in your first card and your last card is so fabulous. I love the city scape. Your just for fun cards are fantastic Joyce!! I'm with you on looking at my sets closer so I don't have too many duplicate images. But it sure is hard sometimes!! Your crafting just for fun are among my favourite posts of yours Joyce! No exception here! wow...how fun to craft just for fun! Must be your new calling because these are all so amazing. I love the beautiful scenes you created with the branches cover plate and your final card, over the top stunning!!! I love what you made, so festive and I can almost here the fireworks going off on your card. Oh my, Joyce! You've own me away!!! Love how you used your new cover plate and way to recreate the different looks with what you already had! I want to be better at that this year, too! The way you colored the vellum is just amazing and your last card...wow! Everything is just perfect...love it! WOW! You have really been a busy girl! I love how you played with your new cover plate (going into my cart right now), and how you cased Laura's design with stamps from your stash! Amazing take on the inspiration photo too, Joyce! Fabulous inking/blending and I love your cityscape...Stunning card!!! Love all these cards. You did an awesome job with the vellum and copic markers. Love the rainbow cards too. I am trying to scale back on ordering new and using what I already have. It's hard but doable. Your card is perfect for our challenge! Thank you for sharing with us at Inkspirational! Happy New Year! So many great cards in one post! I don't even know where to start. 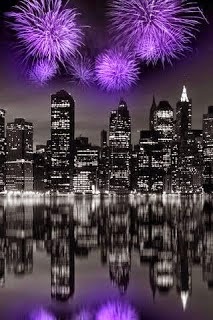 I love the cityscape with the fireworks. The card with the vines and the reclining chairs is so relaxing. I wish I were there right now! I like the simplicity of the birthday cards. They are so colorful for being CAS. Love 'em all!